A reactive balance training program run by Neuroscience Research Australia (NeuRA) has shown a 60 percent risk reduction in falls due to trips and slips in older adults. The results were recently published in Journal of Gerontology: Medical Sciences, and the program is now being replicated to help those with Parkinson’s disease. More than 80,000 people are living with Parkinson’s disease in Australia, and of these, approximately two-thirds will fall each year, resulting in injuries, hospitalisations, and even death. The prevalence of Parkinson’s disease is expected to double between 2010 and 2040. The reactive balance training program works on a ‘retraining-the-brain’ protocol developed from learning on a purpose-built slip-and-trip walkway, the only one of its kind in the world. 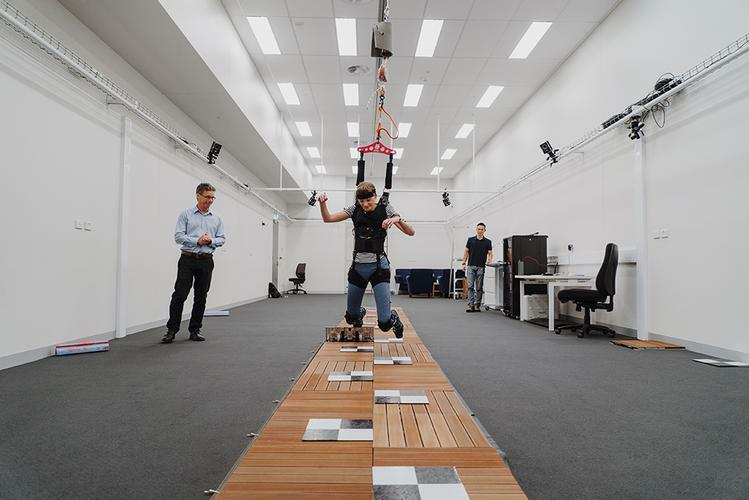 Participants, supported by a safety harness, walk along a pathway which has a series of unexpected booby traps – boards spring up to cause a trip and sliding tiles create a slip – to which the brain and the body need to respond quickly. The learned response mechanism helps to retrain the brain to stay agile, respond faster to potential hazards, and correct its balance to prevent a fall. NeuRA has replicated the slip-and-trip study to reduce falls risks in people with Parkinson’s in a study called SAFE-PD, which is already showing promising results. NeuRA’s Professor Stephen Lord says there have been improvements in the balance and gait of the participants with Parkinson’s disease using the SAFE-PD program. “The early results are in line with the success of our published study, which is encouraging because we know that falls in people with Parkinson’s are widespread and often devastating,” he says. Participants in the SAFE-PD training group work through a series of stepping exercises delivered via a video gaming system and electronic mat connected to their television or computer at home. They train for around one to two hours per week. “The games are inspired by video-games such as Tetris and Pacman, are fun and their difficulty can be easily adjusted. The games are designed to stimulate the brain, muscle, balance and improve quick stepping in desired directions,” lead author on the paper in the Journal of Gerontology: Medical Sciences Dr Yoshiro Okubo says. The participants are then invited to undertake the one-hour reactive balance training using trips and slips at NeuRA at weeks four and eight. NeuRA Chief Executive Officer Professor Peter Schofield says falls can be a devastating and regular event for people living with Parkinson’s disease.